Awareness Seminar on "Intellectual Property Rights" at Qurtuba University Peshawar. 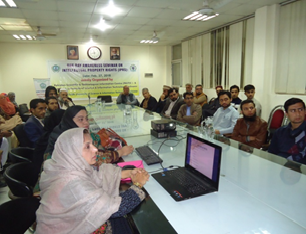 A one-day Awareness Seminar on "Intellectual Property Rights" was held at Peshawar on February 27th, 2018. 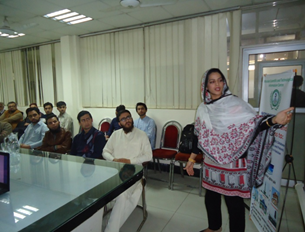 The event was organized in collaboration with Qurtuba University of Science & Technology (QUSIT) Peshawar Campus. The main objective to organize the event was to orient the faculty members/researchers about the basics of Intellectual Property Rights (IPRs) and Drafting and Filing of Patent Application. Targeted audience was faculty members, M. Phil/PhD Scholars and Librarians. Mrs. Hina Zubair (Lawyer / AP at Law College University of Peshawar) was the key note speaker and covered the following areas in her presentation.